With so much focus on people acting in mean and nasty ways, I think it is important to focus on people who do unexpected nice actions. My friend and I were the recipients of one such wonderful gift. While we were walking outside, I saw the Frank Lloyd Wright House that had recently been moved and renovated on the museum’s grounds. The Bachman Wilson House is a wonderful example of his style. We walked up to the house, even though there were no longer tickets available for the day, hoping to at least see the outside. Kiosk with info about the house… And the couple who gave us the tickets!!! How lucky that I had unknowingly taken their photo. On the way to the house is a small kiosk with information about Wright and his more famous structures. We spoke to a couple who were also reading the information. And had a lovely conversation about Wright. Then we all walked up to the house. When we got there, we asked the attendant if we could at least walk around the house even though we did not have tickets to enter. She said, “Of Course.” So we went on our way. Frank Lloyd Wright house. No photos are allowed inside. A few minutes later she called us back. The couple we had met, had been to the house when it first opened, and gave us their tickets!!! They wanted us to be able to see the inside as well. My friend started to cry, she was so happy. At first, we declined, we did not want to disrupt their visit. But they insisted. I turned to the attendant and said, “That is so nice.” She agreed and said to them, “Why don’t you go into the house as well.” So they had the opportunity to see the house as well, but without the headsets to hear the history of the house. Those they insisted that we use. Visiting Bentonville and the Crystal Bridges Museum is well worth the trip south. But the added bonus is meeting such lovely people. Seeing this house from both the outside and the inside made such an impression. We thanked them several times that day….as we crossed their path in the museum. It was such a wonderful gift! A view of the long and winding Beaver Lake. Who knew that I would meet up with my North Bergen childhood next door neighbor in Bentonville, Arkansas? We lived next to each other on Third Avenue for eight years, but remained friends even when I moved to 78th Street and Blvd.East. Strange that the two of us ended up just three hours away from each other. Even stranger, is that I have another North Bergen High School friend who also lives in Fayetteville, Arkansas, whom I have met up with a few times. Three North Bergen High School alumni living in Kansas and Arkansas. Seems strange. But in the world we live in I should not be surprised. We found each other on Facebook. Amazing what social media can do for friendships! I know others who moved to the Midwest, but for me it is always special to see one of these two women who share my childhood memories. 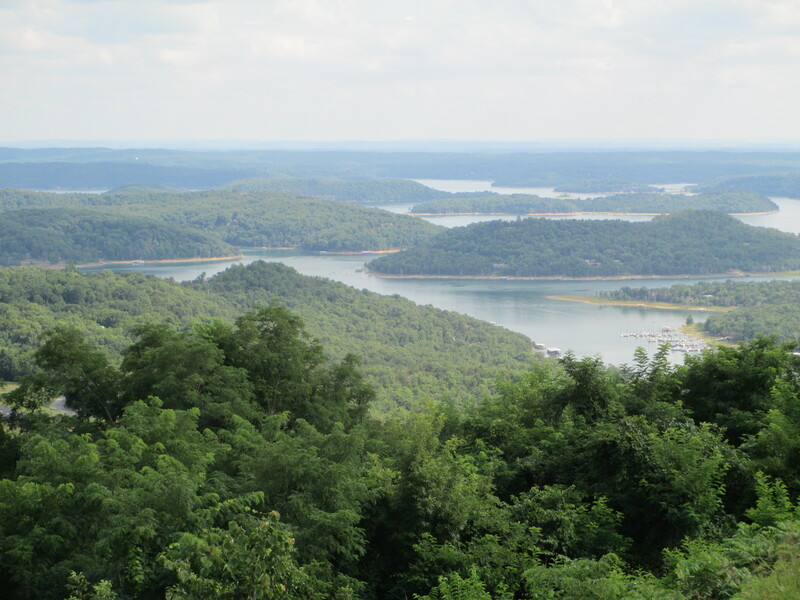 My husband and I were recently in the Beaver Lake area visiting our Kansas neighbors who have moved to their new home near Eureka Springs. 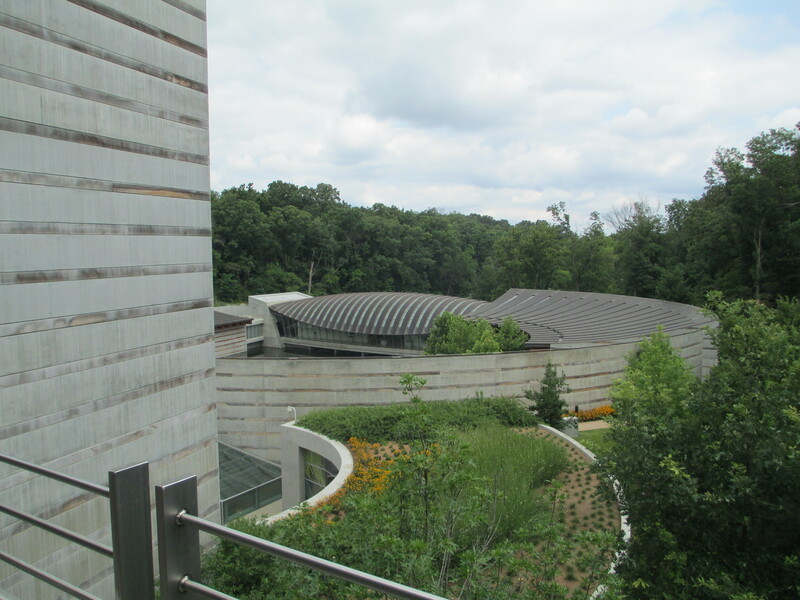 Among our plans were to go to Bentonville and see the beautiful Crystal Bridges Art Museum. Another goal was to introduce my childhood neighbor to my adult neighbors because they now live just 45 minutes from each other. I had a great time making the introductions and combining two segments of my life. We spent part the day walking the grounds of the museum and seeing the exhibits. I was amazed to find a large collection of paintings of George Washington, as well as six portraits depicting the Levy-Franks family. A Jewish family from New York City in Arkansas, besides me! Well, they have been deceased for a long time. But it surprised me that these six works of art were in Arkansas. However, my favorite paintings were by John Singleton Copley. His ability to capture life is amazing! We at lunch at the museum and enjoyed all the sites, before deciding to go into Bentonville. We still had one more museum to see. But when my husband and neighbors went into town for an ice cream treat, my childhood friend and I went to see her 88-year-old mother. It is so strange to see someone I have not seen in over 25years; someone who was like a second mother, who had the right to yell at me if I misbehaved, but not to have my Mom with us as well. Seeing her made me happy, but also made me miss my Mom even more. My friend’s mother knew who I was most of the time. At first she thought I was my mother. And at times she thought I was my sister. But we had a good visit, and she remembered so many things. Her daughter and I were amazed. Actually she spoke most about my brother. “He was a buster!” She said. She remembered how my brother used to tease us when we played with our dolls. We would try hiding on the outdoor staircase, but he would climb over the garbage house to get to us. “Mommy, he is bothering us!” She said as she remembered my brother, who is now such a respectable man, but then quite the active child. We had a special time together, and I am glad we were able to get together. Besides traveling to Bentonville and seeing my old friend, we also went to the Turpentine Creek Wildlife Refuge for rescued tigers, lions, cougars, panthers and bears. It seems, and I did not know this, that many states allow people to have wild animals as house pets. (To me this is a really ridiculous idea.) Not only that, even in states where it is illegal, there are people who take on these animals as pets. They see a tiger cub as a good pet, until it grows into an adult and eats 1000 pounds of food and weighs up to 800 pounds. Then they do not want that pet any more. 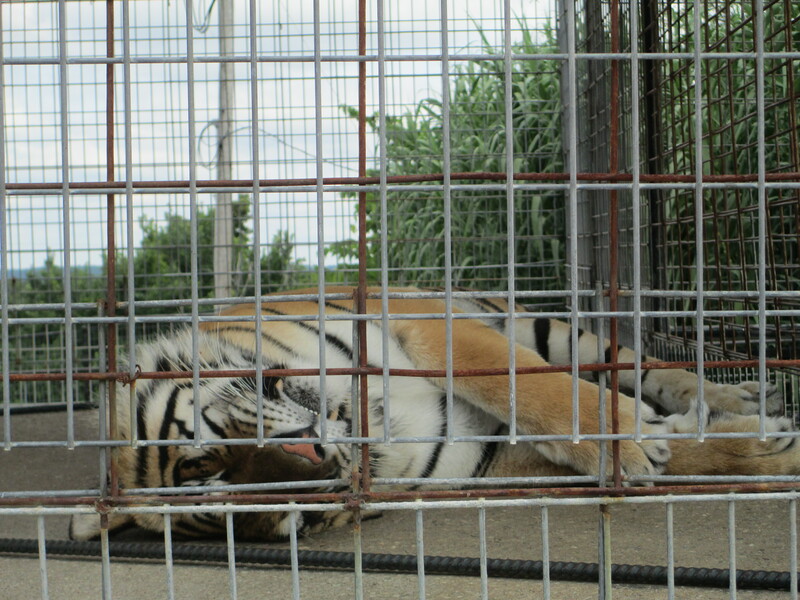 One of the tigers that still has to be moved into his own habitat. What they do to these ‘pets’ is really sad. Sometimes they declaw them. For a house cat it is bad, but for a big cat it is really bad. Once the claws and first digits are removed, then the large cat cannot walk because their weight is too much, basically crippling the animal. Sometimes people just abandon the cats in the wild. They cannot survive. So this sanctuary in Arkansas, rescues them. If someone brings them one of these ‘pets,’ the sanctuary does not press charges. They just want to protect and keep the once wild animal for the rest of its life. They are in the process of developing special habitats for each of the animals so they have room to roam. 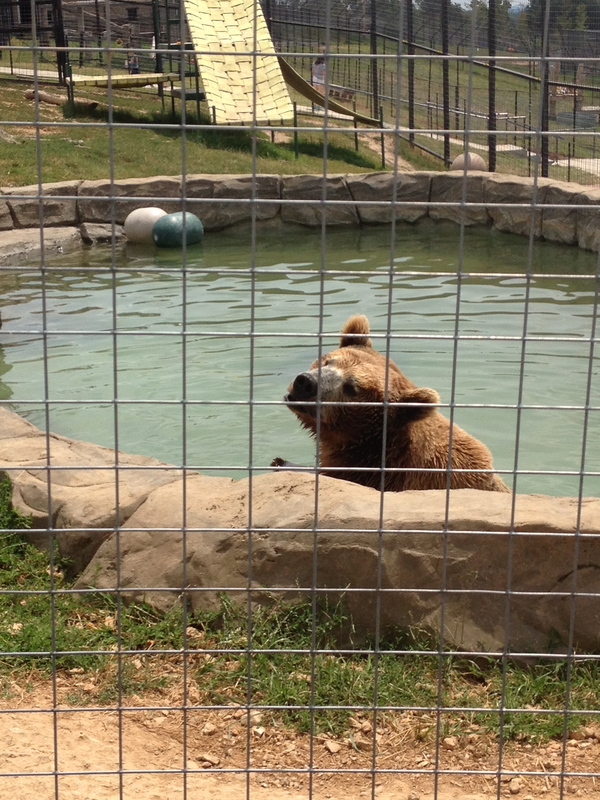 Bam Bam the Grizzly Bear has his own pond and habitat at the Turpentine Creek Wildlife Refuge. Part of their mission is educating the public about these animals. Visitors can tour the site with a docent/game keeper and learn about these animals in particular and what happened and happens to them. For me it was an eye-opening experience. And I plan to add the Turpentine Creek Wildlife Refuge to my list of charities to support. Finally we spent time on Beaver Lake, riding around in our friends’ boat and seeing the sites. It was not the same as riding around Kauneonga Lake in New York, where I spent my childhood summers. This is a much bigger lake created by the Corps of Engineers when they put in a hydro-electric plant and dammed a river, unlike Kauneonga Lake which is a smaller, natural spring-feed lake. But being in a boat on a lake is always a wonderful time for me. Having a long weekend; staying near the Lake was wonderful for so many reasons: spending time with friends, going to a museum, visiting an animal haven.